Well, what can I say…*stands up* "Hi, my name is Nick Stubbs and I bought the Canon EOS 5D Mark IV"! Note: I knocked a star off the "features" in the Canon EOS 5D Mark IV Review due to the lack of video functionality at 4K. 2 stars were taken from "value for money" as it is overpriced (at launch). Update: See what all the buttons, switches and dials on the 5D Mark IV do on our DSLR page. MJPEG - Good Points, Bad Points and Why Are We Arguing? Who is the 5D Mark IV for? The Canon EOS 5D Mark IV certainly caused a bit of a stir when the specs were announced. I was myself initially disappointed with the video features (and still am to a degree). In fact I decided there and then (momentarily) that I wouldn't buy this camera despite waiting for it for so long. Was I swayed too much by the online commenters and haters? Maybe, but I must say I have never seen a camera release create so many arguments and so much pandemonium, hatred, vitriol, trolling and divisive commenting. Perhaps this is the way of the new "divided" world now. Brexit and Trump alone make the old Canon/Nikon argument seem tame by comparison. Some of the points with regards to video I must say are justified in certain respects. Especially when you consider the great expectations that the Canon EOS 5D Mark IV (and 5-series in general) created. I read and researched as much as I could about the 5D Mark IV, downloaded numerous images, RAW, JPEG and Video. Then I played with them, scrutinised them and finally came to this conclusion. For me, upgrading to the Mark IV from my beloved Mark II's was a good move. Note: I still can't lose the feeling that I should be standing up in a circle of people in a support group saying "Hi, my name is Nick Stubbs and I bought the Canon EOS 5D Mark IV" followed by applause for my bravery and courage. I never really took to this argument. After all, the last car I bought was two years old at purchase. It was fairly well loaded with tech but still had less than the later models and I got it for a steal. There's no parking sensors (sob) but no matter. I simply use the parking skills I learned from driving since 16 years old in a basic old banger. So, I refrained from upgrading to any new camera and kept my Mark II's for years because I knew them inside out. I knew I could get the images I need from them and didn't really need the bells and whistles that newer cameras offered at the time. Manufacturers have to release models each year with new "stuff" to entice buyers as they really need to keep their shareholders happy in this cutthroat world. This can be dangerous. Cameras and equipment are being so rushed to market these days, mistakes are happening that truly p*ss off the consumer. Think Go Pro Karma drone (late release and old tech). DJI Mavic Pro (late release missing Christmas). Samsung Galaxy Note 7 (blows up) and so on. It took me three generations to upgrade my phone from the Galaxy S4 to the wonderful S7. Only because the S4 became too slow for modern apps such as DJI Go and I know this will last me a few years. I may sound like an ageing old codger here but I am seriously starting to lose interest in too much new tech. From now on, I am concentrating more on producing good, emotive work that will wow my clients and earn a living regardless of what it was shot on. As I have mentioned in other pages at ATP, I have owned two 5D Mark II's since they came out and love them. The image quality was all that mattered to me so when the 5D Mark III came out, I gave it a miss. The main reason being that not only could I not see any significant improvement in the image quality from the Mark III. I actually saw slightly less details when viewed at 100%. Plus there was no megapixel hike. After downloading a few Mark III images, I simply couldn't match the quality of the Mark II. Despite all the raving going on about the Mark III and image quality, I couldn't agree. The images looked soft to me. "The MK III brought a number of improvements. Better ISO performance, better codec, an almost total elimination of moiré and aliasing and clean HDMI out (with firmware upgrade). We still only had slow motion in 720p at 50p or 60p. The MK II of course had no slow motion. There was also something aesthetically missing in the MK III, some of the magic of the MK II had gone with the image improvements. This was way back in March 2012. It has been a long wait to see a replacement." I also remember him mentioning that the video on the Mark III was definitely soft. He said to only buy it if you didn't mind adding sharpening in post for every video clip. "Resolution, as in detail of the image, looks maybe a tiny bit better but that could be purely psychological as I want…no, need it to be!! My good friend and fellow mk3 owner James Miller has posted his thoughts on this and says the Mk3 looks softer than the Mk2!" So when the 5D Mark IV was released, the first thing I checked was the image quality. Above 4K video, above features and above everything else. After all, I am a photographer not a spec scientist or pixel-peeper. I was instantly pleased to see that the files I downloaded were on par with, if not a little better than the 5D Mark II. At last. All the other bells and whistles with regards to stills photography were the icing on the cake and something I have enjoyed using for the past few months. All of the above make using the 5D Mark IV not only a pleasure to use for stills but also pleasantly familiar as the menu system hasn't changed that much. Nor has the general layout of the camera. The focussing is rapid and highly accurate with a larger focussing area. Coupling the nifty rear touch screen with the dual pixel autofocus makes using the camera a lot of fun. The continuous shooting speed of 7fps on the 5D Mark IV is for me, a significant improvement over the meeker 3.9fps of the 5D Mark II. Much faster! Auto ISO was a huge benefit when it arrived on the 5D Mark II. However, when shooting in manual it was limited to just 400 ISO. This was fixed with the Mark III so for me, having this new, full Auto ISO on the Mark IV is a great help. For instance, when shooting a wedding...either in the church or at the reception in low light, I like to try and keep the shots consistent. By being able to fix the shutter speed and aperture and let the ISO do its thing, I can rest assured. Safe in the knowledge that (up to 6,400/12,800 ISO) all shots will not only be consistent in their look. I can also relax knowing that I have a fast enough shutter speed to capture the action and an aperture to give best results (shallow depth of field etc). Do you know what? I am not even going to go there, it's about as much use as the "direct print" button of old which has now thankfully gone. Dual pixel RAW is pretty useless until they refine it and increase it's capability and it certainly isn't worth shooting files that are double the size for the "highly minimal" flexibility it gives you. Having been a stock photography shooter for more than a decade, image quality is everything. More so than any other shoot I do. This is because the fear of rejection through poor IQ really hurts, especially if the shot rejected was a once in a lifetime shot. ...and so on so the Mark IV for me, had to live up to that scrutiny. I don't know what it is but whenever I buy a new camera, I always think that it will improve my photography skills. Perhaps I seem to think, albeit for a short while, that if I spend a day with this new camera, I will come back with award winning images…lol. Not so. I have now used the 5D Mark IV in a number of situations. On a number of paid, commercial jobs for both stills and video and I know it will be a long and fruitful relationship. Images are clean, crisp and thankfully the Mark IV has retained Canon's wonderful colour tones. Check out the last three images...super high ISO. Low light quality is excellent and just about usable at ISO 12,800. Although once the light drops to that stage and I am struggling, I would tend to add my own lighting anyway rather than risk producing poor images. Whatever camera I am using. If you are thinking of buying the Canon EOS 5D Mark IV, you can scrub image quality from your list of things to check. Trust me, it is there. Arguably not as good perhaps as the 5DSR or the Sony A7R II but those cameras have its limitations too. Let me get this out of the way first. Rolling shutter/jello! The rolling shutter jello effect on this camera when shooting video is appalling. Not only when you are panning fast, or slowly but even when you are locked down on a tripod using a long telephoto lens. Even slight movement from wind or whatever produces jello. Not good! ...as well as a few professional 1080p HD cameras. To cut a long story short, I ended up buying the Canon EOS 5D Mark IV. I have used it a fair bit on both personal and commercial projects, stills and video over the past few months and I have to say, I love it! Is this me trying to justify the purchase a little bit? Not really because of all the research I did prior to hitting the buy button and compared to the 5D Mark II, this thing is a beast and the upgrades for me are excellent. I have used the "bloated", MJPEG-driven 4K and yes they are huge and a pain to edit. However, I find the files incredibly clean, sharp and with superb colours. In fact I am currently preparing many short 5D Mark IV 4K clips to upload to my stock agencies. Plus I use a simple solution to editing by creating proxy files but am still miffed at the sheer size that these files take up. Coming from the Panny GH4, 4:2:2 10-bit Pro Res, the 5D Mark IV is very similar with regards to workflow. It also records 4K at 4:2:2 albeit only 8-bit. The biggest difference is that the GH4 can record 4K to an external recorder whereas the 5D Mark IV only records internally at 4K. This means I need to buy huge, fast CF cards such as the Lexar Professional 256GB 1066x UDMA 7 card I used here. That's enough for about an hour of recording at 4K. The 1080p HD video quality is outstanding. Especially when output via HDMI to the Atomos Ninja Flame at Pro Res quality. It uses the full frame of the sensor whilst producing regular file sizes then add in the dual pixel autofocus tracking and yep, I'm sold. As I said in the video, I would personally rather use a dedicated video camera for shooting lengthy 4K video. Cameras such as the Sony Sony FS5/Sony FS7, the Black Magic Ursa Mini 4K or even the new, fixed lens Panasonic AG-DVX200. I would then use the 5D Mark IV for shorter clips, stock footage and stills photography. However, all of these are also missing from the big brother that is the Canon EOS 1DX Mark II. Less people complain about that camera than they do the 5D Mark IV and the 1DxII also uses the MJPEG codec for 4K video (including 800 Mbit/s for 4K 60p...go figure! Note: I do listen to what Philip Bloom has to say as he has a wealth of experience in the film-making industry. He knows his stuff so I will be keen to hear what he thinks about the 5D Mark IV video (and will he slate it like everyone else seems to)? There are many things which are marvellous about the camera: The touch screen dual pixel auto focus is an absolute joy…more on this in my upcoming autofocus mega vlog! Motion JPEG recording in 4K. whilst unwieldy (and I convert to ProRes LT to edit with it) gives a gorgeous moving photographic image. It is 422 internal, 8 bit but with a huge 800mbps bit rate! The only downer for me is the 8-bit instead of 10-bit. Playing devil's advocate, I get over the lack of focus peaking by using dual pixel autofocus and then switching to manual. Even when using a Smartphone tether and the Canon app. Or, I use the Ninja Flame which gives focus peaking at 1080p (no 4K external recording. Another downside). Waveforms and zebra. I resort back to how I used to judge exposure via the power of sight and common sense. Ok, I am being facetious now but you get my drift. XLR inputs. I have used my Sony radio lav mic to great effect but tend to use other cameras if I want perfect audio. EVF and tilting screen. 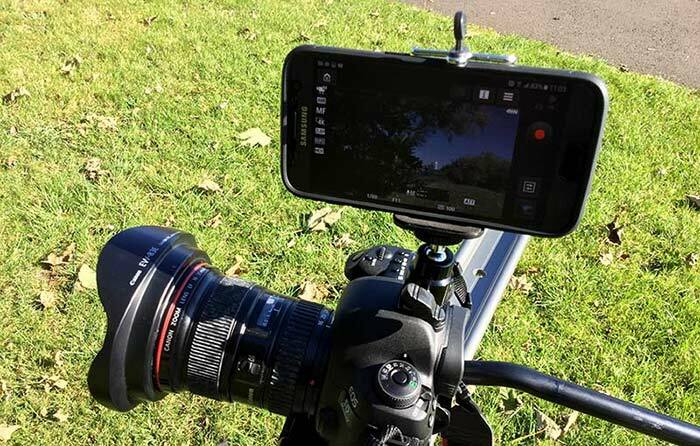 Simple, I use my Smartphone and the Canon app which is like having a tilting screen that you can also detach and use anywhere. I have all the functionality as though I were using the rear screen of the camera including dual pixel autofocus. Better than a tilting screen IMHO especially when filming myself for YouTube videos. I can operate the camera from where I am sitting and if you are a serious videographer, you will normally take time setting up shots anyway so this shouldn’t add too much time to your workflow. Initially I got caught up in the fact that people were letting rip with regards to this "1990's" old-style video codec that produced huge file sizes. It put me off buying the EOS 5D Mark IV for a while I must admit. Is it really that bad and what is all the fuss about? After shooting a fair bit of 4K video on the Mark IV for a while, I am now not only used to it but actually like it. For what I need anyway! If it doesn't suit your own personal needs, let it go, forget it, don't get stressed over it. After all, do you walk into Curry's, PC World, B & H Photo Video, Wal-Mart etc and rant about every single product that doesn't match your needs? Or do you simply move on until you find what suits you? Exactly. …and I am now preparing a huge amount of 4K clips to upload. Two of my commercial clients loved the fact that they could pull infinite, high quality stills from the footage to use on social media. This is helped by the fact that each frame is a single, 8.8mp JPEG similar to what I got from the old 8mp Canon EOS 20D. Here is an "already" cropped (8mp to 5mp) image from the now ancient 20D. Still pretty impressive for an "old" camera and incidentally one of my past favourites! I’m pretty happy with the results and if my clients are too…happy days! Note: In order to pull decent frame grabs from any video, make sure you have either filmed a fairly static subject and/or used a fast shutter speed to freeze the action. Anything moving shot at around 30th second shutter speed will be blurred and unusable for pulling stills. Another point is that because MJPEG records and compresses each frame individually. As in ALL-I Intraframe compression, it retains a lot more detail than IPB which is Interframe compression. This produces much larger file sizes with more information for editing. With Interframe compression (IPB), not all of the frames are kept and individually compressed like ALL-I/MJPEG. Instead, one key frame (or interframe) per every 1/2 second, for example, would be kept in full. For the other frames between key frames, the compression system simply maintains the visible changes and uses the previous key frame to guess what the missing data is. This gives much smaller file sizes. However, it degrades the quality somewhat making editing that much harder with less information to play with. Horses for courses. ALL-I gives higher quality, larger file sizes, IPB gives smaller file sizes and lower quality. When you are shooting static subjects and want to pull stills later on, IPB is good. If you are shooting moving subjects and want to pull stills, ALL-I is better. However, if you are doing intricate, frame-by-frame editing (i.e. using Twixtor or After Effects to slow the motion significantly by "adding fake frames"), ALL-I is the way to go. For the latter, unless you have a mega-computer, you either have to edit using proxy files or spend time transcoding to a different format. It would have been nice to have the option of using MJPEG or H.264/5, .mov etc. For many, this means upgrading their computer and/or buying new or upgrading their existing software. Not great. And? So many people complained about this but why? The amazing Red Epic Dragon ($24k "brain only" with no lens or anything) has the same crop factor at 4K. My Panasonic GH4 has a crop factor of 2.3x when shooting 4K or down to 1.65 with the Speedbooster and Canon lenses and I love it! One thing I liked about the Canon EOS 7D when I owned it was the 1.6x crop factor. It shot straight through any "falloff" at the edges leaving me with just the "sweet spot" at the centre. Making my L glass even better. So, you can either place your tripod a little further back (if possible) or use a different lens. It is such a non-starter argument for me (who shoots a lot of video with both the GH4 and 5D Mark IV) I will leave it at that. If the crop factor is an issue for you, shop elsewhere. Ok, this gave me a scare...a bad one. When I first bought the 5D Mark IV, I assumed that I could simply connect the camera to my PC via the USB 3.0 port and use the camera/CF card like an external hard drive. Looking at the 3 video files I wanted to offload, two of them had a zero figure for file size even though the card showed the full amount to have been used. I offloaded them anyway hoping they would save as full files but they didn't. Recovery software had to be used to get them back as I "cut and pasted" them as opposed to "copy and pasting" them from the card. Thankfully I did get them back. Once they were on the card again, I used the Canon Utility software to select and copy to my hard drive. I have used this method ever since with no issues. Please use the Utility software when offloading images and videos! Well, for stills photographers, it's a no brainer if upgrading from the Mark II or any other "lesser" Canon model. If you are coming from the 5D Mark III, you need to evaluate as to whether the upgrades and 4K video are worth it to you. For many it won't be and it may be more economical to buy a second Mark III if you need two bodies. If you are like me and shoot the occasional, short video clips to incorporate into larger projects or stock video as well as stills photography, then absolutely. I would recommend this camera. If you are a videographer first and foremost and tend to shoot long events, weddings, aerial video and so on then no. Do not buy this camera for that. Personally, when I am in full video mode doing a professional job, I still love the "non-hybrid", professional, made-for-video cameras like my trusty old 1080p Sony PMW EX1. As a stills camera, and upgrading from my lovely 5D Mark II's, the EOS 5D Mark IV is superb. The upgraded features and functionality make a huge difference and I have loved using this camera over the past 3 months. Basically, imagine a 5D Mark III with great new and updated features with 4K video to boot. Regardless of the "old", heavy codec. Don't get me wrong, I do like the video on the Mark IV but like the Mark II, I may not use it as much for video as I do for stills. Saying that, I have already used it for a few clients who love the footage. I have also produced a lot of stock video clips so we will see. For me, to have good looking 1080p and 4K video built into an incredible stills camera is perfect for what I intend to shoot with this camera. Rather than carry my GH4 along with the 5D Mark IV "in case" I spot some stock video opportunities, I feel happy that I can capture those clips (and stills) with this camera alone. I won't however, be using it for major filming projects such as interviews (other than a B camera perhaps), events or weddings etc. The 4K file sizes are just too big. Shooting 1080p for any of those though, especially through the Atomos Ninja Flame, yep, no problem. For larger projects, events, DVD creation, interviews and so on, I have never used Canon video. Only Sony and Panasonic and will stick with those for the foreseeable. Lastly yes, there are better cameras out there such as the 1DX Mark II (more expensive and still uses the same tech) or cameras with slightly better image quality such as the Sony A7R II (or its soon to be announced replacement). Or the EOS 5DSR. For me, after seriously looking at ALL these and other alternative cameras for a while, the 5D Mark IV simply offered a wide range of features that I thought I would find useful for my line of work. It is a bit of an all-round workhorse in a sturdy, reliable body. Overall, a superb camera but definitely overpriced. If you can get one for sub-£3k then go for it. Note: Oh, and I forgot to mention, this little "screw in" gadget cable thingy is so handy. It keeps the USB 3.0 cable neatly and securely attached to the camera when offloading images or updating firmware etc.